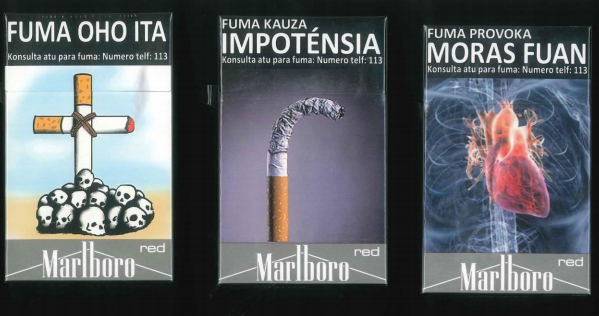 Since 6 September 2018, all tobacco products sold in Timor-Leste are required to display one of the six official combined text and pictorial health warnings covering 85% of the front and 100% of the back of the packaging. because a logo is still allowed and the brand name may appear in a stylized font, the requirements are not fully plain packaging. Even though Timor-Leste did not fully adopt plain packaging, the latest substantial progress propels the country to the first place as the world’s leading country with the largest health warnings on tobacco product packaging with 92.5%, ahead of Nepal and Vanuatu at 90%, India and Thailand at 85%. The Ministerial Statutory Order N° 10/2018 of May 9, Regulations for Labelling of Tobacco Products contains the requirements for package health warnings as well as other packaging restrictions. Available here. This Ministerial Statutory Order replaces an earlier Order with similar requirements but that has now been repealed: Ministerial Statutory Order No. 2/2018 of January 10 on Regulations for Labeling of Tobacco Products. The Decree-Law No. 14/2016 of June 8 on the Tobacco Control Regime, which authorizes the regulations, can be seen here.